Chairperson Glynn introduced his son Brad who then gave a highly informative and interesting talk on the Fankhauser orchard and the apple industry. Brad is the 5th generation of Fankhausers to grow fruit. 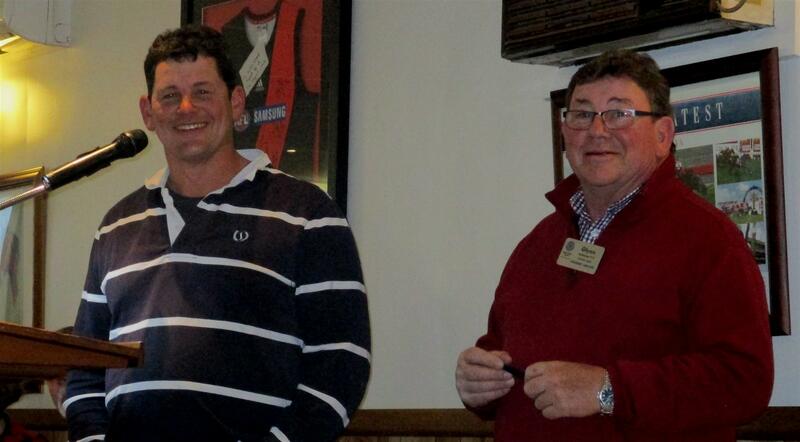 He was the recipient of the Young Grower of the Year, Victoria, 2008 and Australian Grower of the Year, 2015 . Brad has been a member and director of the Fruit Growers Association of Victoria, being Chairman from 2012 to 2014. Brad commenced his talk by stating that he knew most of his audience but that did not make it any less daunting than the speech he gave the previous week to 200 fruit growers. He informed the Club that some Rotarians had worked at the orchard – Kevin is still there. The Fankhauser family came to Australia in the 1850’s from Austria. They initially cleared land in Hawthorn, near the Yarra river before moving out to Balwyn, then Wantirna. Glynn and Liz then moved to Drouin in 1983. In the early days traditional trees were planted – 5m apart and 4 m between rows. This allowed for 3800 trees/hectare. Brad explained that these were big trees which were hard to manage. This has been replaced by high density, spindle orchard – 80cm between trees and 3.3m between rows. They now have 90,000 trees on 40 hectares. This type of planting provides high volume fruit of excellent quality. The orchard employs 5 permanent staff and 40 casuals. Currently at the orchard, they are trialling some new red fleshed apples. This includes varieties that are red skinned and pink flesh through to the core to some yellow skinned apples with pink flesh. These will become available in the next 5 to 10 years. Brad stated that robotics are coming to their industry. In the previous week he had visited an orchard where robotics are being trialled. Brad especially likes the orchard in spring. He says there is nothing better than a beautiful spring day with the bees humming around the trees. He says the downside for orchards is hail and hot weather. Hail storms can destroy the apple crop in minutes, hence they have the orchard covered in netting. Heat is the other enemy of apples. On really hot days any fruit facing the sun becomes sun damaged. Brad spoke of two highlights of orcharding for the family. The first was the discovery of a mutation in an apple tree in their orchard. Brad and Glynn were very surprised that one of the old Gala trees had mutated to produce a new Gala variety. This is now called the Alvina Gala, named after Glynn’s mother. The apple was recognised as a new variety in France and is now registered. A royalty is received for each tree sold. The family are very proud of developing the “Drouin” apple. The second highlight was the production of Aussie Apple advertisement in the orchard. Glynn, Brad and Olly starred in the ad which was developed to combat the importation of New Zealand apples. The apple industry made Brad a bit of a pin up- boy, not a role he enjoyed. Fankhausers currently export 30% of their Pink Lady crop to the U.K. In England Australian Pink Ladies cost twice as much as those from Chile and South Africa as they are much higher in quality.